Climbing information for this p2k peak is found on page 146. Pilot Peak is a P2K peak with 2,087 feet of prominence which ranks it at number 92. 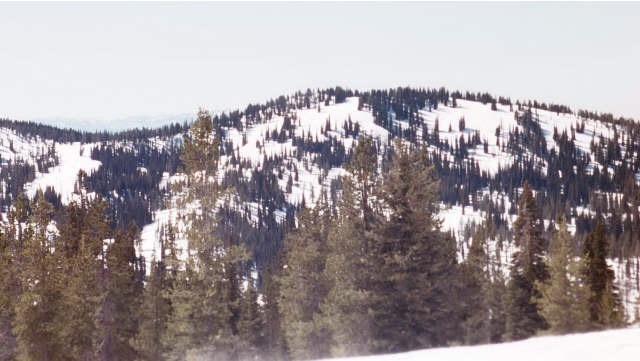 The peak is a very popular winter destination for snowmobiles, skiers and snowshoers. The parking lot on ID-21 at Mores Creek Summit fills up quickly on winter weekends. The summit of this peak is reached by a rugged road that seems to get worse every time I drive it. The road leads to a saddle between Pilot and Freeman Peak. From the saddle it is 0.5 miles to the summit. In the summer, the road is a good route for a mountain bike ascent. 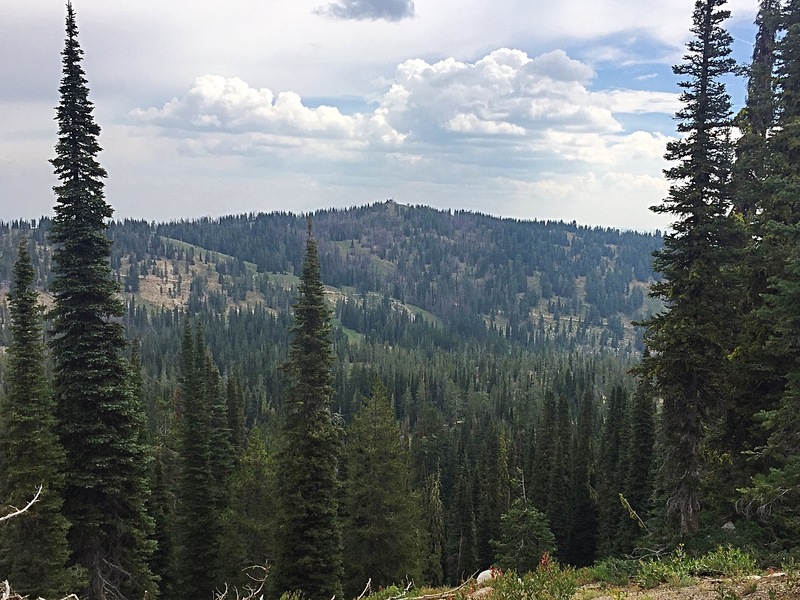 The fire lookout on this peak’s summit has become a hub for communication equipment and is no longer used as a lookout. Pilot Peak from the north. 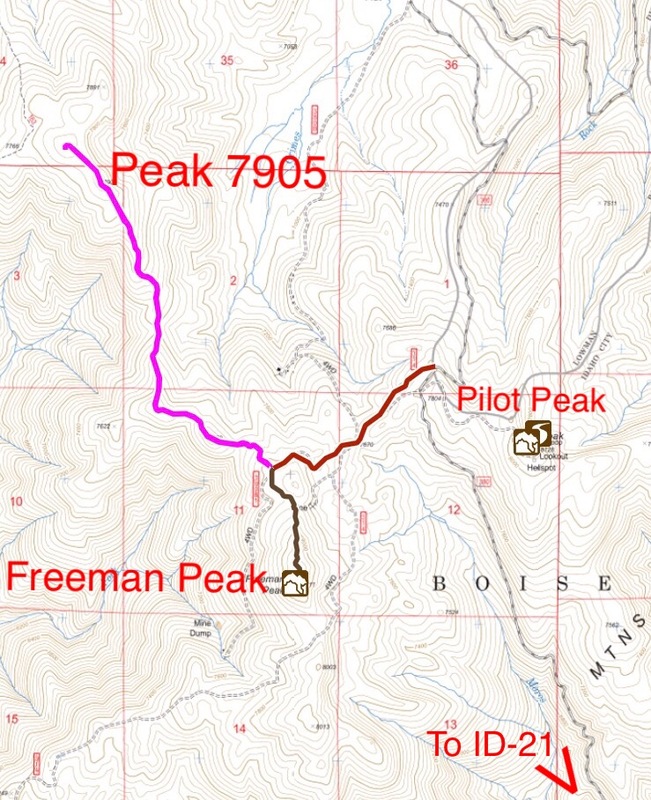 Pilot Peak/Peak 7905/Freeman Peak access. Note, that the FS and USGS topos do not accurately show all of the roads in this area. 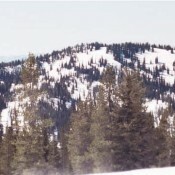 Snowmobilers generally follow the road while skiers often climb the peak via variations on its south ridge. Freeman Peak is nearby and can be easily climbed from the saddle between the two peaks.